The last English team to win a Champions League knockout game at the Nou Camp were that awkward bunch at Liverpool in the mid-part of the last decade, who reached two finals, and came to Barcelona in February 2007 just as the cracks were showing in Frank Rijkaard's side. The defending champions were beaten 2-1 by Liverpool, whose goalscorers were Craig Bellamy and John Arne Riise. Should Manchester United do something similar in the same stadium tonight, they will be the first visiting side to win in the Nou Camp in any European game since Bayern Munich in the semi-finals in 2013. In 2007, Liverpool lost the home leg 1-0 the following week, but prevailed on away goals. When Chelsea triumphed in Barcelona in the semi-finals in 2012, they did so with a 2-2 draw that, achieved with 10 men, was enough after a win at Stamford Bridge. They had just 28 per cent possession, the kind of game when they could stay on the ropes and pray that Barcelona punched themselves out. Liverpool had a bit more in 2007, 38 per cent possession, but on both occasions it was about the art of winning with less and hoping that Barcelona were below par. The Barcelona of 2019 are different again, of course, even though the trend is very much that, like their predecessors, they lose very few games at home. Ole Gunnar Solskjaer's side have settled naturally into a counter-attacking rhythm since he took over and they have their famous victory against Paris Saint-Germain at the Parc des Princes to sustain them. But this is arguably the hardest stadium in which to pursue that line. Solskjaer faces a different challenge to Chelsea in 2012 - he has to go for it at some point. Asked about that approach he sounded like a man who had decided that United could not go out wondering what might have been. He lamented that his players "didn't stamp our authority" on the first leg, although stamping authority upon Barcelona rarely means controlling the ball. "We didn't keep the ball as well as we should have and didn't create enough chances," Solskjaer said. "There are some freak results at times against Barca, where you (win and) have 85/15 (per cent) possession or 80/20 (in Barcelona's favour). "We know we have to perform better than 80/20, to try to stamp our authority on the game. If you give players time on the ball, too many chances to create, you'll suffer. I hope we are not just going to be camped outside our own box." The burgeoning school of Solskjaer mysticism was fun while it lasted but, if United are to progress, they need a plan - one that will likely involve allowing Barcelona much of the ball. Solskjaer mentioned set-pieces more than once, and the physical power of his team in that respect. He promised his players would "run until the cramp takes them". The early first goal against PSG in the previous round was crucial, he said, and if his players can get that then the dynamic of the game - and the tie - would be changed. Since that Chelsea elimination in 2012, Barcelona have beaten Manchester City twice in the first knockout round, in 2014 and 2015. When they have been eliminated by English opposition - Liverpool in 2007, United in 2008, Chelsea in 2012 - it has been teams on their way to winning a Champions League or having recently done so. By contrast, these are early days in the Solskjaer reign and, unlike the PSG tie, so critical in securing his appointment, this feels less urgent. United could go out at this stage having had their European triumph for the season and there would be little drama. That works against United. So too that Barcelona manager Ernesto Valverde was able to rest players in the league game against Huesca on Saturday. After three consecutive quarter-final exits, this campaign feels especially important for Barcelona. Were they to win it, this would be Lionel Messi's fifth Champions League, taking him level with Cristiano Ronaldo - still in the competition with Juventus. Since Barcelona last won the Champions League in 2015 they have claimed two out of three domestic league titles, with a third surely on the way, but in Europe they have underperformed. That is the challenge Solskjaer is up against above all: a team who really have to win. He lamented his players allowing their focus to slip in the home leg, when he said they allowed Sergio Busquets too much space to pass to Messi to create the goal. "Belief is one thing and concentration another," he said. 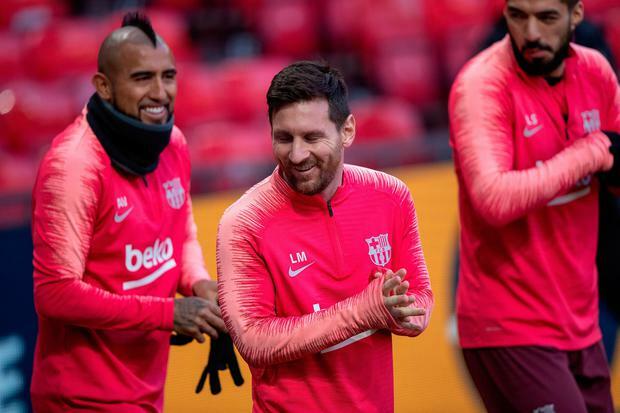 It will have to be the perfect game, the kind of defeat for Barcelona that they have not suffered since 2013 and on an evening when there is much more at stake for the home side than the underdogs hoping to pull off a shock.